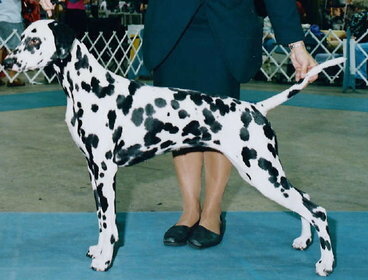 Brittany finished her championship with a 5 point specialty win at the Pittsburgh Dalmatian Club Specialty show and a BOB over specials. Setting out to prove that she was not just another pretty face, Brittany racked up obedience and agility titles in AKC, UKC and NADAC trials. A wonderful partner for our Lager, four of the "kids" from their litter finished championships, and five of them are either titled or training in performance events as well. Who says you can't have it all!? The next generation of Woodwynd/Glendale partnership has begun with Ian having been bred to Sassy. This litter produced specialty winners, best in show winners as well as obedience title holders.